Transparency Market Research (TMR) has published a new report titled, “Metastatic Bone Disease Market - Global Industry Analysis, Size, Share, Growth, Trends, and Forecast, 2018–2026”. 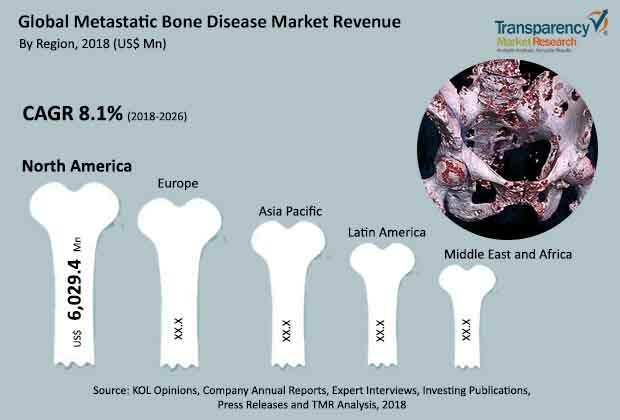 According to the report, the global metastatic bone disease market was valued at US$ 12,450.0 Mn in 2017 and is projected to expand at a CAGR of 8.1% from 2017 to 2025. Rise in incidence rate of cancer across the globe, favorable reimbursement scenario, stringent regulatory policies assuring better product quality, increase in cancer research funding and new drug approvals, and surge in cancer awareness programs by governments and patient support organizations drive the global metastatic bone disease market. Improved hospital infrastructure in the developed markets such a North America and Europe and rise in medical tourism in Asia Pacific are expected to propel the market during the forecast period. Metastatic bone disease treatment is covered under the Medicare Act in the U.S., while the National Health Service (NHS) provides reimbursement assistance in the U.K. Moreover, large number of public and private insurance firms offer complete or partial financial aid and reimbursement for the treatment of metastatic bone disease. Favorable reimbursement scenario in the U.S. and Europe, where metastatic bone disease is highly prevalent, is expected to fuel the growth of the market in the near future. Prevalence of diseases such as cancer, diabetes, and neurological disorders has increased due to rise in geriatric population and changing lifestyles in developing economies. These factors are anticipated to drive demand for better diagnosis and prevention of cancer in the near future. This, in turn, is likely to present opportunities to companies operating in the metastatic bone disease treatment market. Moreover, adoption of advanced treatment options is increasing in developing regions. Availability of superior treatment facilities in developing countries such as India and China at prices lower than in countries in the West is a major factor driving the metastatic bone disease market in these emerging markets. This attracts patients from the U.S. and Europe toward these countries. Moreover, growing medical tourism in developing economies is anticipated to open new avenues for the metastatic bone disease market in the next few years. High price of other therapeutic procedures such as surgeries, chemotherapy, and radiation therapy results in out-of-pocket expenditure for non-insured cancer patients. The price of drugs adds to the overarching financial burden of the treatment. Hence, generic versions of these drugs are expected to witness strong demand in the market. Consequently, sales of branded drugs are likely to decline and these drugs can be permanently replaced by generic counterparts in the market. Asia Pacific is one of the fastest developing regions in the world. High per capita income has increased consumption of pharmaceutical products in the region. Prevalence of various cancers is also increasing in countries such as Japan, China, South Korea, Malaysia, and India, making Asia Pacific a lucrative market for metastatic bone disease treatment. Moreover, Pacific countries such as Australia and New Zealand, with a Caucasian population that is susceptible to metastatic bone disease, are poised to be attractive in the next few years. The report also provides profiles of leading players operating in the global metastatic bone disease market such as Amgen, Inc., Merck & Co., Inc., F. Hoffmann Du-La Roche Ltd., Novartis AG, Eli Lilly and Company, Bayer AG, Fresenius Kabi AG, BTG plc, Boston Scientific Corporation, and Medtronic.